I make the majority of my living from translation work, and a lot of the translation work I do is in academic research and market studies. Thankfully academic and professional journals have a kind of standard format that moves from an introduction to data to discussion. But at the sentence level I see everything from very concise direct statements, to paragraph-long, parades of clauses that will leave you gasping for air should you attempt to read them end-to-end in one go. What I’m trying to say is that no matter how good your grammar is, there’s always going to be that one line where the writer tried to get crafty, and by the time you reach the end of it, you’ve forgotten what the first half was about and there’s such a hefty collection of grammatical structures throughout that discerning how they interrelate can be simply frustrating. To confront these monstrosities we’re going to use particles and punctuation to break them down in to digestible portions. Now the following sentences may be a little out of your league right now, but with some studying and maybe some classes you’ll get there—keep the faith! For now focus on what you do know and how it can be put to further use in the future. These same strategies can be applied to whatever Japanese material you decide to read. As your ears begin to get better as well, hearing where what particles pop up in sentences will also make it easier for you to mentally break down something someone says to you that doesn’t quite process right away—it’s tricky but a good skill to develop down the road. These examples come from 聖☆おにいさん, which also bears the English title Saint Young Men. It’s a humorous slice of life comic where Buddha and Jesus share a flat together in Tokyo. I haven’t read much of it, but it’s massively popular in Japan, winning awards and selling like hot cakes. If you’re looking for some lighter reading, subject-wise, and a laugh this may be what you need. Although it’s not restricted to an older audience, it doesn’t have reading guides alongside the kanji for you either, so you’ll still need a good way to look up kanji if you’re just starting in on the reading-side of Japanese. Did your eyes just glaze over? For those of you looking to expand your Japanese studies by reading comics, you will find rather quickly that the first page of many series is comprised of dense exposition that in most cases is much more challenging to read than any other part of the story. And while you can likely figure out the premise of the manga once you’ve read a little, sometimes backing down from a fight with the page just won’t do (if you get bogged down to the point of severe frustration however I do recommend jumping forward a few pages in whatever comic you’re reading; just try to gather what you can from the pictures in the early part). In the case that you’re determined to sort out the bit of troublesome text however, as I indicated before, your best bet is to dissect it. Let’s try it with this sentence. The following part is where things get tricky. The next bit before Buddha is a clause that modifies Buddha and Jesus—almost like a whole sentence acting as an adjective. Japanese writers love these kinds of clauses and they can be a real pain when trying to work out a sentence because you’re reading along and then all of a sudden discover the last 15 words were just a kind of preamble describing the subject of the sentence. Fortunately we knew this one was going to be a mouthful before we got started so we were able to work back from the main subject to the entire subject; in a sense, we came prepared for just this possibility. What we need to do is take this portion and think of it as a short sentence describing our main subject of Buddha and Jesus: 世紀末も無事に乗り越えた [End of the century も safety に ride past]. Since it’s basically its own sentence we start from the subject again. One of the particles that wasn’t covered earlier is も, which can also mark a topic and means “also” or “too” in reference to an earlier subject/topic. Now for the predicate. Try it. Look at the particles, their possible meanings, and try to pin down what they mean based on the context and the English meanings I’ve provided. Don’t scroll down until you’ve given it some serious thought. 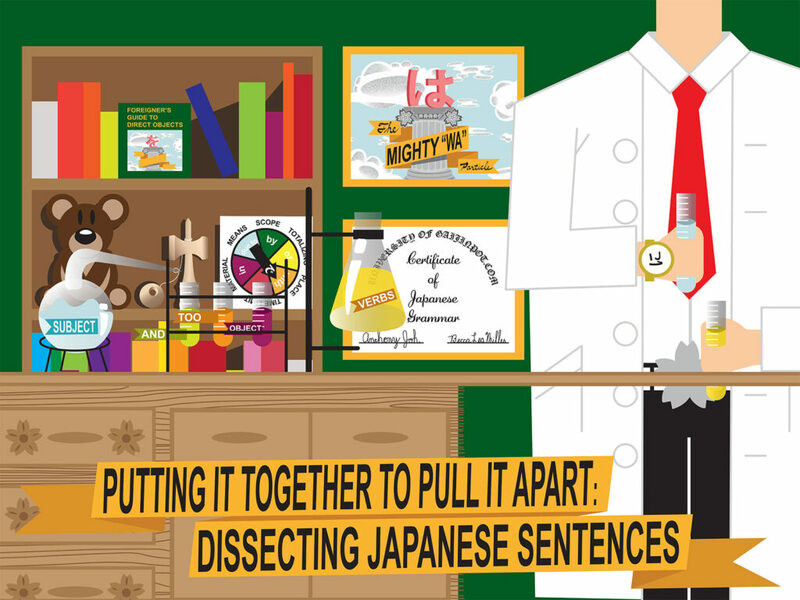 Don’t cheat yourself on the path to Japanese language greatness! As a brief aside, the portion that I’ve labeled as “end of the century” can also refer to “the end of an era,” and in the comic really refers to the end of the millennium. In most dictionaries you will get “end of a century,” however—just remember to keep your brain limber. Today you get two sample sources. This second sampling includes two lines from the first page of the Rurouni Kenshin manga. Try to find the subject/topic markers and identify the subject of the sentences. This is not easy; do not get discouraged if you struggle with it. Scroll down just a bit to see the correct particles highlighted in red. I’ll try to give you a translation that closely mimics the Japanese: “Beginning circa 140 years ago with the arrival of Commodore Perry’s ships with black sails, during the turbulent ‘Bakumatsu’ period, in Kyoto, a patriot called ‘the swordsman who cuts down men’ was present.” I realize the “swordsman who cuts down men” sounds dumb in English but it’s kind of cool in Japanese, and it gives you an idea as to why some things are best not translated directly. Also in case you were curious, 「these markers are basically Japanese quotation marks.」And hopefully you didn’t struggle too much in finding the subject of #2. Now, not all Japanese sentences are this cumbersome. More often than not your subject will be just a few words rather than a train of a clauses, but I purposefully chose these examples to try and explain how to deal with the more irksome bits of prose you might encounter. Remember not to get discouraged. Gradually everything starts to make sense, and that’s a pretty great feeling.